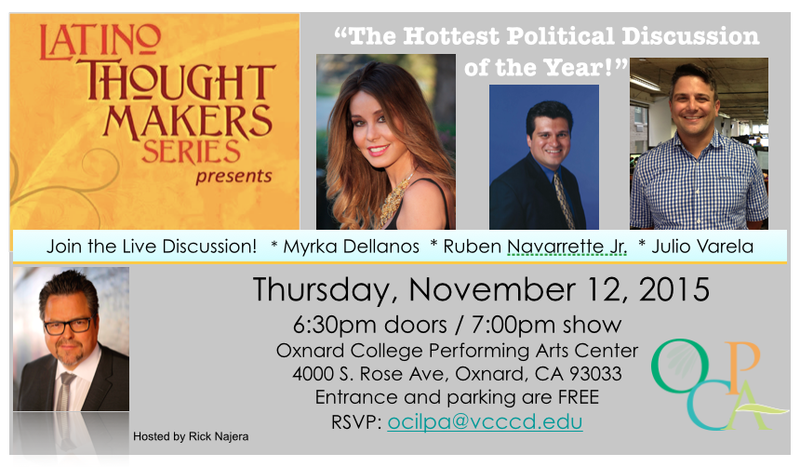 Oxnard College Institute for Latino Performing Arts is pleased to present the hottest political discussion of the year with host Rick Najera on Thursday, November 12 at 7:00pm as part of Oxnard College’s Latino Thought Makers series. Entrance to the event is free. Guests for this special and lively debate include the beautiful and talented Myrka Dellanos (Emmy Award-winning journalist and author), nationally syndicated columnist Ruben Navarrette Jr. and award-winning journalist, Julio Ricardo Varela. Topic themes: The political landscape in America, left, right and in the middle! DON’T MISS THIS EXCITING OPPORTUNITY! RSVP today on our Facebook invite.